As a career scientist, one of the most discouraging aspects of this whole Van Norden Lake debacle is to observe the way science can be bought and paid for to support any position. I may have been spoiled a little because I worked most of my career in a lab and under academic peer review, so you couldn’t really get away with much. 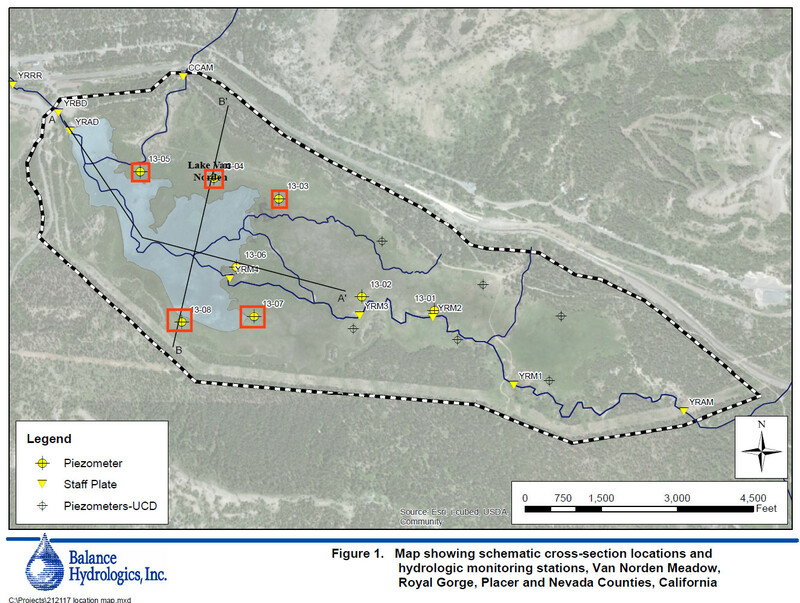 Now that the Truckee Donner Land Trust has brought their project to drain the lake and wetlands to Nevada County we can finally see all the “studies” that they hired out to local “science” companies. In this post we are going to look at one of these self-serving studies and see just how financial bias can affect the interpretation of the data. Included in the project supporting documents is the document “Groundwater Effects during Draw down 20160209“. Ostensibly this report describes groundwater measurements over a period from August 2013 to November 2015. The last month of this period included the “draw down” (aka draining) that TDLT was forced to do on the lake because they failed to obtain water rights. The conclusion that the study supposedly supports is that the level of the lake has no effect on groundwater levels in the Summit Valley. A premise that is hard to understand since one definition of a lake is the “exposed level of the ground water level”. So lets take a look at the data which is shown in Figures 1 & 2. Sorry about the weird colors and squiggly lines that represent the groundwater levels at the various measuring points but that is the way Balance Hydrologics made the graph. So the first point that the report makes is that the groundwater levels are higher than the lake which may give the impression that the lake does not contribute much. What is misleading is the fact that all of these measuring stations are higher in elevation than the lake. The lake is of course at the lowest point in the valley and water flows downhill. Moreover unlike the groundwater, the lake has a set height which is the level of the spillway. What is really important here is what is the depth of the groundwater which is really important in determining the availability of the groundwater to plant life. But the kicker in this little exercise is the data during the draining of the lake in October 2015. The draining is evident by the precipitous fall in the lake level. And when you look at the ground water levels for the measuring stations near the lake during the draining they are going up. The conclusion made by Balance Hydrologics is that lowering the lake has no effect on groundwater levels. 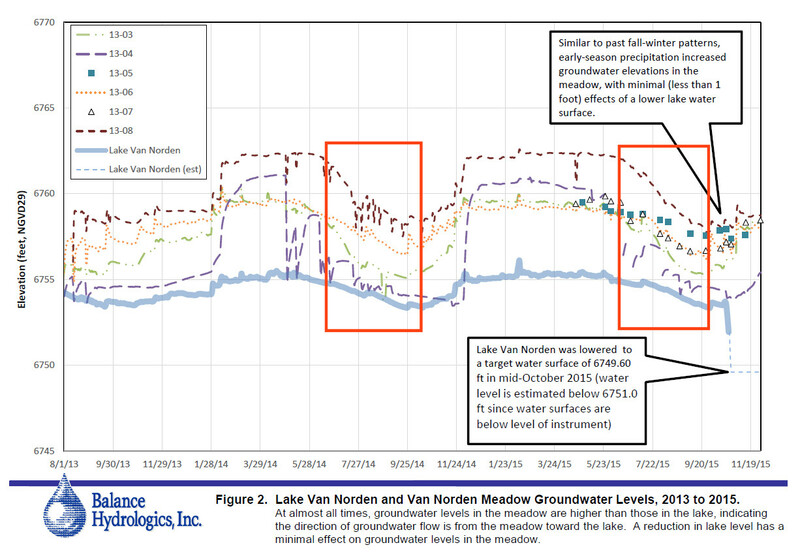 In fact, from this interpretation of the data you could conclude that lowering the lake increases groundwater levels. Completely counter intuitive, but seemingly supported by this data. Of course this conclusion makes no sense and is not at all supported by this data. Just look at the October-November periods from 2013 and 2014. The same phenomenon right? However now look at the little footnote on page 1 of the report. The reason that lowering the lake had no effect on groundwater levels is because the fall rains had come and the groundwater was being recharged from the surrounding watershed as it is every fall. In fact we even had a little snow during that period. The reality is that this data is completely useless in determining the effects of draining the lake on ground water levels. The critical time to observe the effects of the lake on groundwater levels is in the summer (red boxes) when groundwater levels are no longer being charged by melt water (like right now out in the Summit Valley). While we haven’t seen that data, it would only make sense that during the critical summer period, groundwater levels will plummet without the lake to charge them when the discharge has stopped. So you have to ask yourself why would Balance Hydrologics make this unsupported statement. Are they unaware of the seasonal fluctuations in the Valley? Of course not. Does it help support the position of their paying client Truckee Donner Land Trust to get the project approved? OF COURSE IT DOES. Unfortunately, the supporting studies commissioned by TDLT are riddled with little data manipulations and distortions like this (you may see more in future posts). It is “science for hire” in its glory. We are also left with the question of for all the supposed supporting studies like this that they are submitting, surely there must have been data that did not support their project. Where is that data? “Only when the tide goes out do you discover who’s been swimming naked.” – Warren Buffett Well, the tide has gone out at Van Norden Lake, and the naked truth is that the Lemon Willow tress are wilting and dying, because the groundwater they have had around their roots for 100 years, has evaporated. The chickens have come home to roost for TDLT, as the waterfowl have NOT come home to roost, on the boulders in Lake Van Norden. TDLT’s “science” is now proven to be just “Junk Science”.